"May God bless the noble horse! His breast is of steel and his flanks are of iron…” Arabic poem. As we were getting ready for the breeding season both Henry and I looked at each other and said we need to use him again because it is his daughters that have taken us to the next level and he is a 1994 stallion, so 22 years old now. We could use another one or a fantastic son for that matter. As we geared up for the breeding season as usual we checked all the stallions fertility only to discover that Saroukh's is the best we have ever seen! Yea, hooray for Saroukh. He continues to age well. So, we gave him Sheikha Sara SMF (Symbolic SMF x Bint BInt Sayo by Ali Saroukh) . We are happy to report that Sara is in foal to Saroukh for a 2017 foal. This breeding if you look at their pedigrees exhibits the old breeding adage of "if the sire is also the grandsire of the dam" this is a good nick. Sara looks in phenotype much like her grandam Sahbine who was a full sister to Saroukh. It is always an interesting project to look through a pedigree pictorially to see just whom they resemble the most. Sara exhibits more of the Ansata Sabiha side, a very rounded yet square on all four corners mare with a great body, just a very complete mare. We love the upright quality that Saroukh typcially contributes along with many other attributes. This will be a really fun breeding to watch the result of our choice. This year as Saroukh became 21 we began to see him aging more, this is not surprising as he is now into his twenties. Still, it gives me a pang to realize he is our eldest stallion at the farm now. I adore this big boy! Since Shai has passed on it seems Saroukh took a new role on as the leader in the barn and it shows in his more serious approach to everything, even when greeting visitors. Before he was more of a clown and I kind of miss that role he played for so long. I don't think we give the horses enough credit for the affect that losing herd mates has upon them. His daughters have been our next giant leap in quality with their produce. 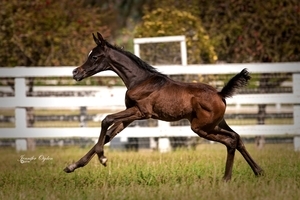 They continue to show with every foal an amazing ability to produce exceptional foals. Sidon SMF, his son, was on lease this year and will possibly be next year as well to Trevor Miller and Arlene Padilla for the Zee King daughters they have. This should be an awesome cross of bloodlines. Trevor showed him at the Golden Gate "A" Show this spring in both Amateur (Champion) and Open Stallion (Reserve Champion) and he was also a Top Five (3rd) at the Region III show in Reno with Trevor handling. This winter he will be trained under saddle so watch for him next year! Saroukh daughters are rarely shown by us because they are just so valuable that it is not worth it to take the risk. However, 2 daughters were shown minimally; Bint BInt Sayo was the 2014 Foal Festival Gold Champion Produce of Dam and Jade Lotus SMF was Reserve Supreme Champion Mare at the 2009 Egyptian Event. His daughters, Danikah SMF (x Dance Diva by Raquin RA) is in foal to Jasoor SMF for a 2016 foal and Divine's Gift (x Dance Divine SMF by Simeon Shai) is in foal to Symbolic SMF for 2016. The weaving of Shai and Saroukh has been a beautiful blending. Also keep your eye on Hadi Al Jood the 2014 grey Ali Saroukh son out of Hadarah SMF owned by Mohamed Jaidah of Qatar. This year Saroukh is twenty years old and for some reason this hits me as much older than nineteen! Silly but true. He sired a colt for Al Jood Stud in Qatar that is exquisite this spring. Look for Hadi Al Jood on our Foals page. The other mare in foal to him unfortunately lost her colt sired by Saroukh in a late term abortion, very sad. His daughter Haalani SMF gave us another filly by Symbolic but this time she is grey, we named her Hadeel. Bint BInt Sayo by Saroukh gave us possibly the best colt we have ever bred by Noble this year, his name is Shazad SMF. The Glorietasayonaara family continues to be the main one at SMF improcing each year. If you want a foal of his or to breed to him hurry up!! On the plus side, his daughters continue to be incredible producers and it does not seem to matter which mare family among the mares of the Dahmah or the Hadbah families. All are wonderful! His daughter Danikah SMF is in foal for 2015, it is her first foal and by Symbolic SMF so a close breeding. Even though Saroukh is now nineteen years old and soon to be twenty he continues to delight Henry and me! We love his impressive carriage and amazing charisma, he has that “wow” factor. The influence of Saroukh on the Silver Maple program is becoming more and more apparent with each succeeding generation. Henry and I have one son of Ali Saroukh at SMF, Sidon SMF out of Shaboura (PVA Kariim x Sahbine out of Glorietasayonaara x Ruminaja Ali). Yes, he is inbred and this mating happened at the urging of Bazy Tankersly of Al Marah Arabian fame. She encouraged us to really set the type by doing this. He is definitely prepotent for a huge curving neck, deep shoulder, movement, tail carriage, presence and power. How we will use Sidon remains to be seen. Two more fillies by Saroukh were born in 2011 that are now gracing our pastures. They are Divine’s Gift SMF out of Dance Divine (*Simeon Shai+ x Dance Diva by Raquin RA) and Danikah SMF out of the mare Dance Diva (Raquin RA x Antigua Dance by Ruminaja Bahat). Both fillies are a blend of Hadban Enzahi and Dahman Shahwan families. The consistency of look combined with exceptional type is just what we need to move our program forward and improve each generation. We see this is as a very successful blending of these two bloodlines plus adding to the tapestry of our personal breeding program. The Ali Saroukh daughters have a major role in the future of Silver Maple Farm; they seem to be perfect for use with our stallions as well as stallions with outcross bloodlines. Bint Bint Sayo (Ali Saroukh x Samura by Anaza El Farid) produced a 2012 filly by Symbolic SMF (Majestic Noble SMF x Shaboura by PVA Kariim) named Sheikha Sara SMF. This filly’s pedigree has our straight Egyptian foundation mare, Glorietasayonaara represented three times. Typically, we consider oursleves mare line breeders, meaning that we look to the mares to ensure the physical traits. We believe these prepotent physical traits of the straight Egyptian mares were established over multiple generations (at least 14 generations to present day) tracing back into the 1800’s in Egypt and before that in the desert regions of the Mideast. It is Henry’s and my belief that you need an understanding of these mares and the ability they have to contribute significantly to any program. We take the view that they are timeless treasures that have the ability to influence the future quality of each new generation. Sheikha Sara SMF a 2012 grey filly will carry forward through her pedigree three times the SMF foundation mare, Glorietasayonaara. This is important to us because she intensifies specific physical traits that we so cherish from this family such as elegance, high set necks with clean throat latches, large dark eyes, chiseled heads, floating movement and wonderful minds. Sheikha Sara also has the mare, Magidaa five times in her pedigree along with the mare Deena, two other powerhouse mare lines and significant dams in straight Egyptian pedigrees here in the United States. The Ali Saroukh daughter, Haalani SMF out of Ansata Haalah by Ansata Iemhotep has produced two very beautiful and exceptional bay fillies, one in 2012 (Hasna SMF) and another in 2013, (Al Bouraq Haana SMF) by Symbolic SMF (Majestic Noble SMF x Shaboura by PVA Kariim). Again, they typify the intense line breeding that for us at SMF produces huge dark eyes, exotic faces and amazing quality, traits that we cherish and continue to celebrate. 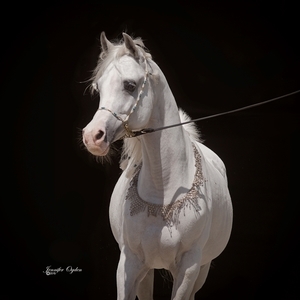 Jade Lotus SMF (Ali Saroukh x Imdals Jade by Imperial Imdal) is a gorgeous and extremely charismatic daughter that has given us three foals; all of them exceptional and by three different stallions. 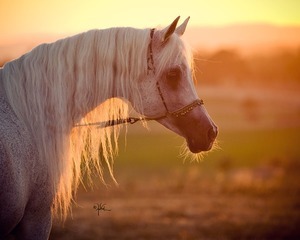 Jasoor SMF by *Simeon Shai+, a four year old Junior stallion at SMF and the fillies Jada SMF a four year old Grey mare owned by Athala Arabians and a grey filly named Jewel SMF born in 2013 by Khaled KA, very tall and refined. For those of you that desire to add movement, large dark expressive eyes, tail carriage, a charisma plus marketable foals please consider a breeding to Ali Saroukh. Ali Saroukh-12(1) from Christie Metz on Vimeo.